If you are considering a contemporary style round end table, our Amish Fremont Round End Table would like to throw its hat in the ring as a spot for the living room or office items you like to keep close at hand while lounging or working from the sofa. 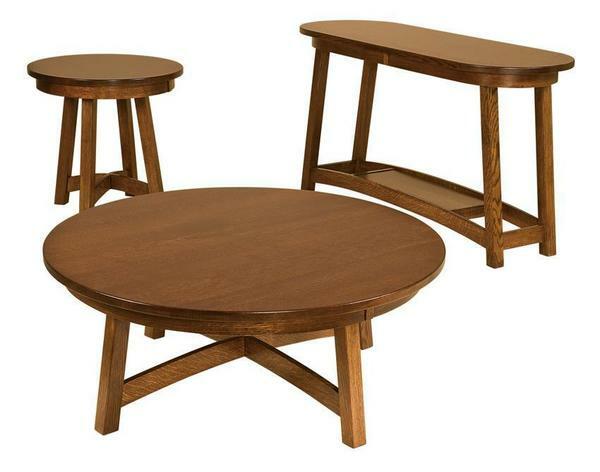 Featuring a 1-inch thick top, steam bent solid wood apron, splayed legs, and X-design at the base the clean lines of this round end table will pair well with a variety of design styles and can be custom-made from your choice of wood type and finish. Shown in quarter sawn white oak with Michael's cherry stain.